What is Non-League Day, when is it in 2018 and how can you find your nearest game? With England reigniting the nation’s love for international football across a glorious summer of Three Lions, World In Motion and ‘It’s coming home’ memes, it was hoped that the optimism of the World Cup would sustain itself going into a new cycle for the national side. Maybe, rather than moaning on about how much we all hate the international break – as has been a favourite national pastime for years – we should recognise its developmental value and get behind Gareth Southgate and the lads instead. Unfortunately, and this is quite a fundamental issue, a two-week international break is still impossibly slow compared to tournament football or the domestic season. Only now there is the additional difficulty of trying to understand the Uefa Nations League, a competition format so bureaucratic and inaccessible it makes the Brexit White Paper look like OK! Magazine. For those who will inevitably be left feeling bored and listless over the next fortnight – and it’s okay to be one of those people – there is an antidote. It’s Non-League Day this weekend, giving us all an opportunity to support a local club, have a beer (or a Bovril) on the sidelines and stand for 90 minutes alongside an adorable dog. In case you’re unfamiliar with Non-League Day, here’s a quick explainer. Established in 2010, Non-League Day started out as a Facebook event among friends and has spiralled upwards from there. Timed to coincide with the international break, the aim is to support community clubs with bigger crowds and invaluable extra gate money. Working with the FA, Supporters Direct and the Football Supporters’ Federation among others, the organisers have won support from a variety of Premier League and Football League clubs. While the powers that be have long been preoccupied with the question of how better to support the grassroots game, Non-League Day is a way for fans to make an impact themselves. Saturday 13 October, with matches generally kicking off at 3pm. How can I find my nearest game? The Non-League Day website has its own match-finder tool, which allows fans to find their nearest game by postcode. 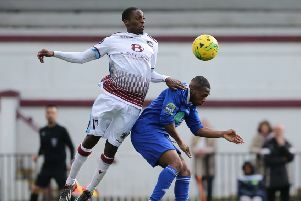 Other than that, a full list of fixtures can be found on the website of the National League, Northern Premier League, Southern League and Isthmian League, as well as the various regional leagues at the ninth tier and below.